As customers and service providers begin to consolidate more and more applications and workloads onto shared storage infrastructures, it becomes increasingly difficult to coordinate outages for planned downtime for things, such as hardware refreshes. This difficulty is because many users, groups, or customers might be using the shared storage infrastructure at the same time. Users expect these infrastructures to be available 24/7, so it is imperative that service outages that are required for storage life-cycle management, cost/service-level optimization, and any other planned downtime do not disturb the availability of the always-on infrastructure. 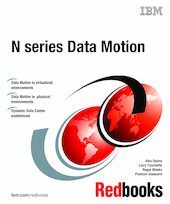 In this IBM® Redbooks® publication, we introduce you to the business value of Data Motion and its features. Storage and system administrators, data center managers, and IT as a service (ITaaS) providers will benefit from reading this book. In this publication, we assume that you have a basic knowledge of N series storage systems and Data ONTAP®, SnapMirror®, MultiStore®, and Provisioning Manager. A complete understanding of all Provisioning Manager features is not necessary. Also, basic knowledge of host and vFiler management from Provisioning Manager is sufficient. Data Motion significantly improves the availability of shared storage infrastructure by avoiding the service outages that are associated with planned activities, such as storage life-cycle management and cost/service-level optimization, thus helping you to enable an always-on IT environment.